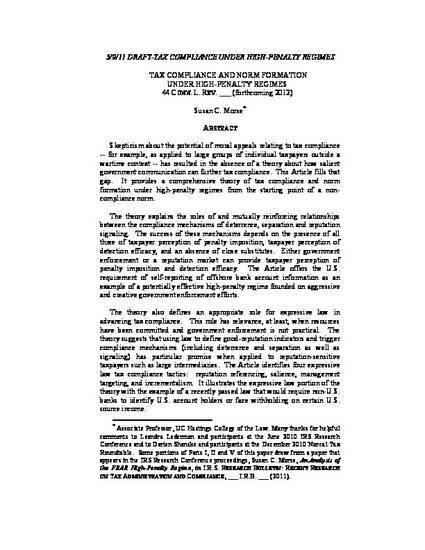 Skepticism about the potential of moral appeals relating to tax compliance -- for example, as applied to large groups of individual taxpayers outside a wartime context -- has resulted in the absence of a theory about how salient government communication can further tax compliance. This Article fills that gap. It provides a comprehensive theory of tax compliance and norm formation under high-penalty regimes from the starting point of a non-compliance norm. The theory explains the roles of and mutually reinforcing relationships between the compliance mechanisms of deterrence, separation and reputation signaling. The success of these mechanisms depends on the presence of all three of taxpayer perception of penalty imposition, taxpayer perception of detection efficacy, and an absence of close substitutes. Either government enforcement or a reputation market can provide taxpayer perception of penalty imposition and detection efficacy. The Article offers the U.S. requirement of self-reporting of offshore bank account information as an example of a potentially effective high-penalty regime founded on aggressive and creative government enforcement efforts. The theory also defines an appropriate role for expressive law in advancing tax compliance. This role has relevance, at least, when resources have been committed and government enforcement is not practical. The theory suggests that using law to define good-reputation indicators and trigger compliance mechanisms (including deterrence and separation as well as signaling) has particular promise when applied to reputation-sensitive taxpayers such as large intermediaries. The Article identifies four expressive law tax compliance tactics: reputation referencing, salience, management targeting, and incrementalism. It illustrates the expressive law portion of the theory with the example of a recently passed law that would require non-U.S. banks to identify U.S. account holders or face withholding on certain U.S. source income.